Our delightful Scruff the plush dog full body puppet by Aurora is the perfect interactive tool for parents, classrooms, churches, and other groups and provides hours of inventive play will take your child's imagination to wonderful new places! Well crafted for a friendly appearance and ease of control, our Scruff the plush dog full body puppet measures 14 inches long and is made of a soft, realistic quality plush with an ample opening that will accommodate both child size and most adult size hands. As with all of Aurora's award winning puppets, our dog full body puppet is made from only top quality materials and is designed withstand the rigors of multitudes of puppet shows and childhood cuddling. 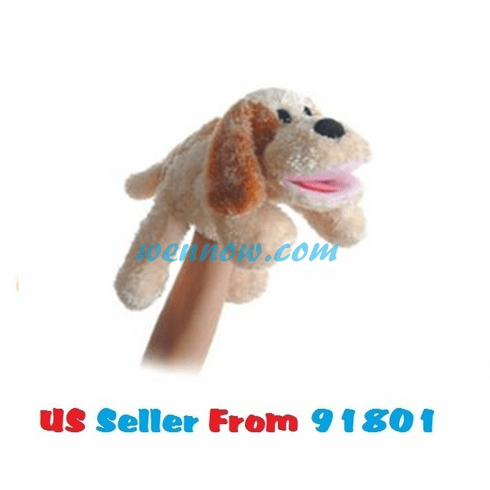 Scruff the plush dog full body puppet is rigorously tested and meets or exceeds all US and European safety standards; we suggest surface washing for this plush puppet. Recommended for ages 3 and up.